John Robertson has high hopes for Daniel MacKay (pictured). 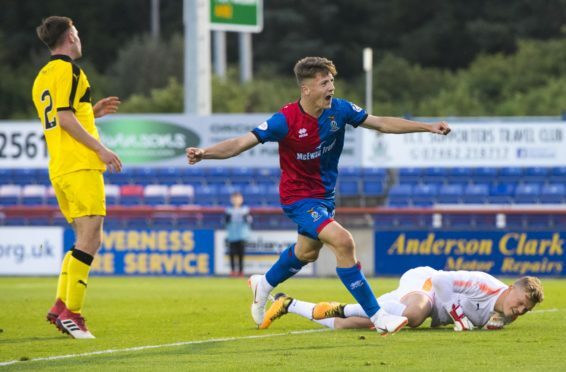 Caley Thistle manager John Robertson feels his three January arrivals have helped to ease the burden on some of Inverness’ young prospects. Robertson brought in defender Kevin McHattie along with attacking midfielders Darren McCauley and Anthony McDonald during the transfer window, with the Inverness boss not making any further moves before last night’s deadline. While Robertson has high hopes for the likes of Daniel MacKay, Roddy MacGregor and Cameron Harper, he feels his new additions will allow him to ease them into the first team rather than throw them in at the deep end. Robertson said: “We have said before that for us it’s quality rather than quantity. “Bringing Kevin McHattie in covered a few positions for us, but we looked at the rest of the squad and thought we needed more competition in the front areas. We just felt bringing in a couple of attacking midfield players would put pressure on the guys who are already there and give us good quality back up. “We have been relying on the likes of Daniel MacKay, Roddy MacGregor and Cameron Harper. Whilst they are very talented with a fantastic future at this club – we can’t wait to get them in regularly – we just felt we needed people with a wee bit more experience. “Darren McCauley is very powerful and has got a goal in him, while Anthony McDonald is very tidy on the ball and he has fitted into our style of play very well. “For the first time this season it gives me options, and a bit of a headache about who I’m selecting. “It’s what the first team group needed, because they now know that if they don’t keep the high standards they are performing to just now, the people that are coming in are not 17-year-old rookies. They are boys with real talent and pedigree behind them, and the likelihood is they might struggle to get their place back. MacKay this week received his first call up for Scotland’s under-19s squad for friendlies against Spain and Azerbaijan later this month, with the 17-year-old having recently returned from a knee injury which sidelined him during the festive period. Robertson believes MacGregor and Harper can also force international recognition in the near future, adding: “It’s a tremendous honour for Daniel. Billy Stark spoke to me about the trip a few weeks ago and he had Cameron, Roddy and Daniel in his thoughts. “Obviously Daniel has made the squad and it’s nice timing for him because he’s got himself back fully fit, on the periphery of the first team squad, and he’s now got that further fillip where he’s been selected for Scotland.